While Yahoo! CEO Marissa Mayer recently made waves by banning working from home, flexible hours and work-from-home initiatives are becoming significantly more common across America. As a result, more and more homeowners are looking to find space in their home for an office. The basement is a logical choice. Working from home isn’t easy. But there are more than enough examples of efficiency to prove that working from home can be a highly effective strategy for agile, modern companies. Working remotely allows a small company to have representatives all over the country without requiring office space – and other businesses can save money on utilities and rent by getting many of their employees to work from their own homes. 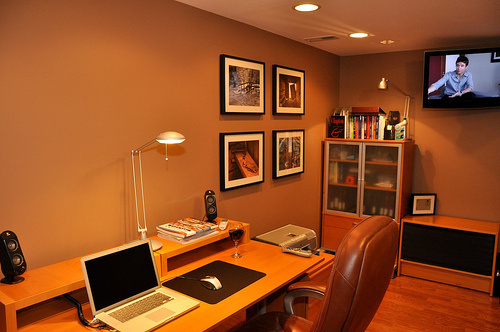 In creating a comfortable and productive work environment at home, many employees look towards the basement. A finished basement is a great place to step out of “home” mode and into the office mentality, even though the commute is merely down a flight of stairs. But while a home office has, literally, many of the “comforts of home” it also has a few things missing. For many work-from-home employees, sunlight and fresh are two of those things. Workers in cubicles already complain of S.A.D. – Seasonal Affective Disorder, or depression stemming from hours spent under buzzing florescent lights instead of the sun. Working in a basement contributes to that same problem – which is why it makes a smart choice to install a basement window at the same time you convert your basement space into a home office. An egress basement window well features an opening window that can be used as an emergency exit in the event of a fire or emergency. It can also be used as a regular window during the rest of the time – offering a source of natural light and free and easy circulation in the basement; providing a much more pleasant working environment. It’s a small detail – but one that can make all the difference in turning a “home office” into an office that feels like home. It’s also a smart investment. However you finish your basement space – whether it becomes a family room, guest bedroom or home office – a “means of egress” is part of national building code and an addition you’re required to make to keep your home up to legal standards. Adding an egress window well won’t just pay for itself by making working from home that much more productive – it also adds value to your property.